The "Rocky" star offers a boost to wife Jennifer Flavin Stallone, left, and her line of skin-care products. Eden Prairie-based Evine Live Inc. is leveraging its new Los Angeles studios to draw some Hollywood star power. The TV shopping channel announced in December that Oscar-winner and fitness guru Jane Fonda will promote her new line of athletic apparel and equipment out of the California studios later this year. 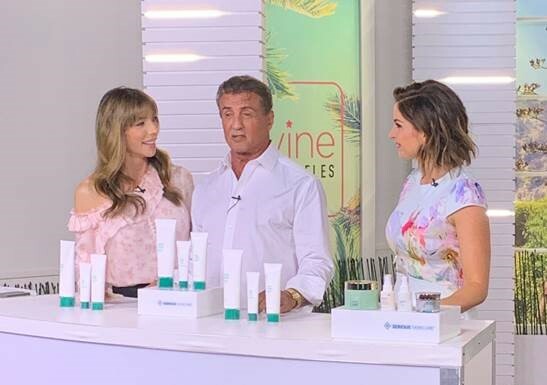 And in a major coup, the company wooed Jennifer Flavin Stallone away from St. Petersburg, Fla.-based rival HSN, where the model-turned-entrepreneur had spent more than two decades building her Serious Skincare beauty line into a best-seller. Serious Skincare sold out of almost a dozen products after its Jan. 3 premier in a three-day, 17-hour marathon at Evine Live's Minnesota studios. But Flavin Stallone said the ease of hosting most shows near her LA home was icing on the cake of a new business partnership. Last Saturday, her actor-husband, Sylvester Stallone, dropped by the California set to add buzz to his wife’s new shopping channel. Stallone bantered with his wife and crew for several minutes, then created some light chaos on his way out. With his wife laughing and mildly mortified, Stallone plopped her black stiletto right onto the table. The couple’s oldest daughter has also been on Evine’s LA set, which broadcast its first shows in October. Flavin Stallone said she enjoys incorporating family into her business.